Imagine being given a festival to curate. One day, one stage, 40,000 people. Who would you choose? How would you choose? This is precisely the premise of TW Classic, a one-day extravaganza held the weekend after Belgium’s famous Rock Werchter (they use the same site and infrastructure). 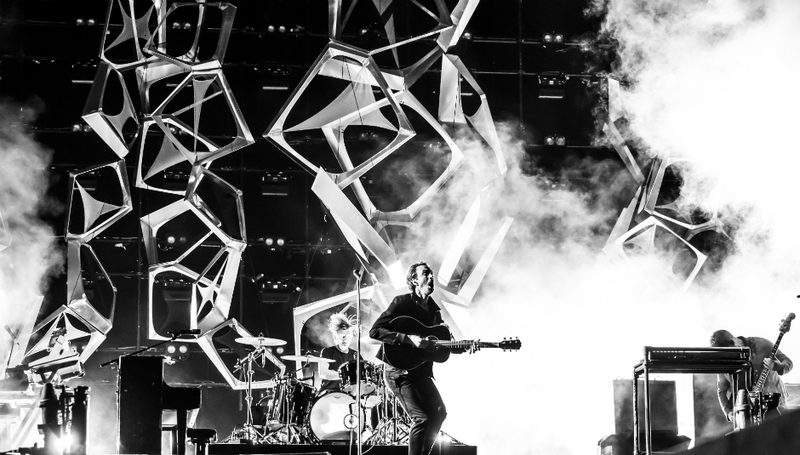 Created in 2002, the idea was to pay tribute to the early days when the main festival was known as “Torhout-Werchter” – hence the TW – before becoming a multi-day event in 1996. Previous editions have seen the likes of Depeche Mode, The Rolling Stones, and Bruce Springsteen headline, with the undercard packed with up and coming local acts but this year Editors, fresh from the success of one of their most acclaimed albums and biggest tours, were tasked with selecting some bands and filling the top slot. The lineup they settled on is a somewhat eclectic list, with the running order looking a little odd on paper. BLØF, one of the Netherlands’ indie-rock heavyweights, are a solid opening act, easing the early birds into things under blue skies and a blazing hot sun, but it’s surprising to see Richard Ashcroft follow immediately afterwards. In an hour we get only three of his own songs, the rest being tracks from his Verve heydays (all of which sound magnificent, if a little downbeat for a summer afternoon). Nathaniel Rateliff & The Night Sweats bring a bit more energy to the stage, their good time blues’n’soul combo provoking plenty of dancing and feel good vibes. Many locals have one eye on the Belgium v England third-place World Cup playoff game, not least cult heroes dEUS, one of the country’s best-loved and most influential bands. They’re a little late for their slot but ecstatic about Belgium’s 2-0 victory, violinist Klass Janzoons wearing a huge flag draped around his shoulders. It’s yet another new era for the band, with long-term guitarist Mauro Pawlowski, who recently left to pursue other projects, replaced by esteemed jazz and bluesman Bruno De Groote. Despite being only his third gig he slots in seamlessly, and they deliver a typically madcap, buoyant set, ‘Instant Street’, ‘Bad Timing’, and ‘The Architect’ all sounding as vital as ever. Not many can effortlessly switch from the headrush punk-funk of ‘Fell Off the Floor, Man’ to the wistful beauty of ‘Hotellounge (Be The Death Of Me)’, but then dEUS are no ordinary band; even having to curtail usual closer ‘Suds & Soda’ because they run out of time is so typically them. At first glance, The National’s slot seems a little early considering their current status as headliners-in-waiting, yet watching the likes of ‘Bloodbuzz Ohio’, ‘Fake Empire’, and ‘Terrible Love’ as the setting sun casts a deep red glow over the site is truly magical. The band conjure plenty of fire and beauty as always, all subtle and nuanced one minute, soaring and majestic the next. And through it all there’s Matt Berninger in full-on, ragged, wild-eyed rocker mode; he paces, he tears at his collar, he wanders out into the crowd. 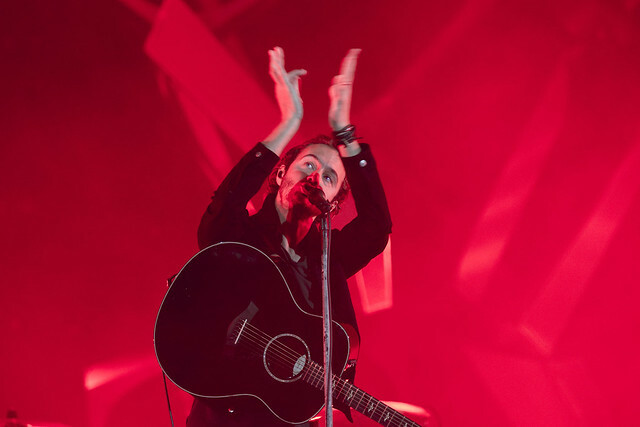 He’s a magnetic presence, despite this being one of those shows where his voice struggles to match his physical intensity – several times it’s just not there for the crescendos and high notes. But such rawness fails to detract from the spectacle of watching a band on top form. Indeed, this human fallibility makes them all the more endearing, Berninger cast as the everyday hero who triumphs in spite of occasionally spinning off his axis. The contrast to Kraftwerk, and their studied, machine-precision electronica, is marked – they’ve been touring this 3D show for a number of years now, and while the pristine sound and perfection of every element of the visuals remains as impressive as ever, there’s something a little lacking in terms of connection. As a heritage act, their influence and pedigree is beyond reproach, but live they suffer from predictability – the friction in their music has been polished away. If you took the four individuals off stage and simply queued everything up, would the show suffer? Would anyone even notice? And so to Editors, a band who are virtually rock royalty round these parts, regularly selling out 20,000 capacity arenas. Walking on to ABBA’s ‘Gimme Gimme Gimme’ and wearing a set of Kraftwerk’s 3D glasses, frontman Tom Smith prowls the walkway that juts out into the crowd looking every inch the rock superstar. The opening salvo of ‘Cold’ and ‘Halleujah (So Low)’, both taken from this year’s Violence, show off their newfound electronic palette – the latter in particular explodes with downright filthy synth riffs – before a rip-roaring ‘An End Has A Start’ that’s more urgent and thrilling than ever whips the crowd into a frenzy. 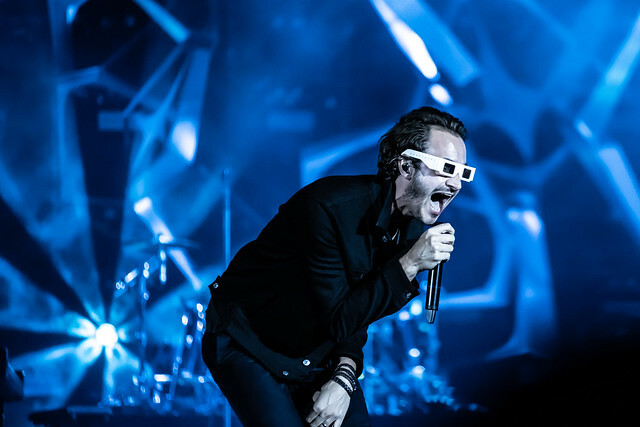 The band have always existed in the cracks between styles and moods – part Depeche Mode, part Coldplay, they switch effortlessly between crowd-pleasing guitar anthems and darker, more sombre fare. It’s impressive how easy they make all this seem; one minute it’s all giddy abandon with glitter cannons and sing-along choruses, the next it’s ominously foreboding synths and pounding industrial drums. The hits sound magnificent – the driving, darkwave angst of ‘Papillion’, the post-punk tightness of ‘Munich’, and the hands-in-the-air rush of ‘The Racing Rats’ – as does the new material, slotting in seamlessly and adding texture to their sound. It’s a bombastic set, but there are moments of tenderness too; we’re treated to an acoustic version of ‘Ton Of Love’, and they close with Smith alone on guitar for fan favourite ‘No Sound But The Wind’, the song he wrote for The Twilight Saga: New Moon that sat atop the Belgian singles chart for weeks in 2010. Up there, alone, carrying ballads just goes to prove his magnetism; whether sweetly strumming, pounding his piano, or simply strutting across the stage, where Smith leads the band follows. On stages like this Editors soar, their ambitions finally matched by the acclaim they so richly deserve.